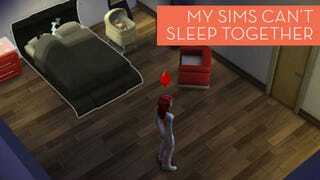 I've been playing The Sims 4 nonstop since Monday. Despite seeing various reports of players encountering glitches and bugs, my first few hours with it went over smoothly. No demon babies, no accidental dates with the grim reaper, nothing. The game ran like a dream. If you're not deep into The Sims, it might be difficult to appreciate what's going on here. So let me break down the events leading up to this awkward moment of two-person musical beds. The blue woman in the video is a Sim I created named Patty Hewes. Yes, that's a reference to Damages. She's shacked up with a man named Gil, the first male Sim that she met and began flirting with. The two aren't married. In keeping with her namesake character, I'm not sure they ever will be. But they recently had a baby together, so I invited Gil to move into the Hewes household to help out with the child-rearing while Patty continues to amass her fortune as an aspiring evil millionaire. Ever since Gil arrived, he's officially become part of that playable unit in The Sims 4, meaning that I can now toggle over to him and control him the same way I've been guiding Patty along from the very beginning. Things have been going over swimmingly, except for this one snag: the two of them can't seem to figure out how to get into bed together anymore. The video removed the game's UI, but what I'm doing here is selecting Gil and then clicking on the bed to activate the "sleep" function. If Patty is already sleeping in the bed, Gil gets confused by this command. He looks around the room and waves his hand, calling out. A little thought bubble pops up over his head showing Patty's face. My Simlish is a little rusty at this point, but I think this means that he's looking for Patty—as if he's suddenly not able to recognize that she's already in the room with him, along with the bed. The same thing happens when I reverse the roles and try to get Patty to jump into bed instead. If only one of them is in the room, meanwhile, I don't have any issues telling one of them to take a nap. I first noticed a problem with this shortly after the couple had the baby, and tried shuffling things around in the room in case the issue was something related to the way the game charts the path a Sim is meant to travel on. Things seemed to return to normal after I moved the baby and her bassinet, but that only worked for a few day/night cycles before it started to flare up again. EA has already put out its first round of updates for The Sims 4. And judging by the characteristically silly patch notes, babies seem to be the cause of many of the game's early problems. I didn't see anything in the September 1st patch notes about Sims not being able to sleep in the same bed together once they've had a baby, however, so this could be a new problem. Alternatively, I could also be missing out on something very basic about how Sims move around the world and interact with their surroundings. The game is still very new, after all, and as I mentioned in my initial reactions, the game's controls have been the most difficult part of The Sims 4 for me to master so far. Though to be fair, the common real-world stereotype would have us all believe that couples see a sharp drop-off in their..."woo-hooing" (to put it in Simlish) and general level of intimacy in the period immediately after a woman gives birth. So maybe The Sims 4 is just being its good old fashioned life-simulation self? UPDATE (12:20 pm): A lot of readers have responded to this by asking if I tried to move the bassinet. I did try that at one point and it didn't seem to fix the problem, so I've updated the story to reflect this. That being said, I've also changed the headline and the wording in the piece because Kotaku's readers made me realize that it's not fair to call this a bug or glitch when I still haven't figured out the source of the problem. The Sims 4's controls can be a little whacky at times, as can the pathfinding in the game, so I don't want to rule anything out. Apologies for misleading anyone, and thank you as always for keeping me on my toes. I understand the point here, and EA has provided some solid evidence. I'm not entirely convinced, however, because my Sims couple managed to sleep together on several occasions when the bassinet was there, and the issue surfaced at least once after I tried moving the bassinet according to my notes from yesterday. If it is a pathfinding issue, then the actual "glitch" here could be the fact that they managed to sleep together despite one Sim's route to the bed being blocked, which would then suggest that there's not actually any underlying problem other than my own stupidity. In either case, I'm going to continue monitoring and testing the game to see how this and any other performance issues shake out going forward.